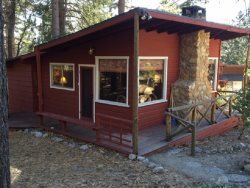 This lovely octagonal home is tucked away between Idyllwild and Pine Cove and offers the serenity of semi privacy and the comfort of being within 2 miles of town. Beautiful wrap around deck with plenty of relaxing/dining space surround this cabin. If you'd like to do some peaceful reading, take advantage of the built in seating on the deck. Kick back in the morning with your coffee or load up the picnic table with bar b q for the whole family. Either way, you will be sure to enjoy the tons of little critters that come to visit in the yard. Squirrels, chipmunks, many varieties of birds, and even deer. Up stairs, in the loft are two twin trundle beds. There is plenty of room to play board games or build blanket forts up here. Sure to be a hit with your kiddos. Pine Cove area is located at a higher elevation than the town of Idyllwild. If you are looking to get away to a secluded and quiet property you may find one to your liking in Pine Cove. Pine Cove is 7 miles from Lake Fulmor, has one small convenience store right off of HWY 243, and has some amazing hiking trails and views. Pine Cove is between 3 and 4 miles from the town of Idyllwild.